I don’t think I’ve ever been so glad to see the month of April arrive. Seriously, what was UP with the winter of 2014? Sheesh. Here’s my month of March, documented in daily photos. It started with snow and cold but it ended with flowers and beer. And homemade bread! There was good stuff in between, too, like the Spinathon and St. Patrick’s Day. Sock knitting and the Oscars. It was a long month, wasn’t it? You found the good, though. March was unsettled and crazy, but our April is shaping up to be worse! Hope your April if full of fun, color, and JOY!! I am hoping for a better April. Despite the weather, you made the best of it. If it’s any consolation we have about 5 inches of snow this morning and it’s still coming down. It hardly feels possible that any of us lived through March. But, now April is here- spring! birds! flowers! boxes! packing! oh, is that just me? indeed, it is all good. 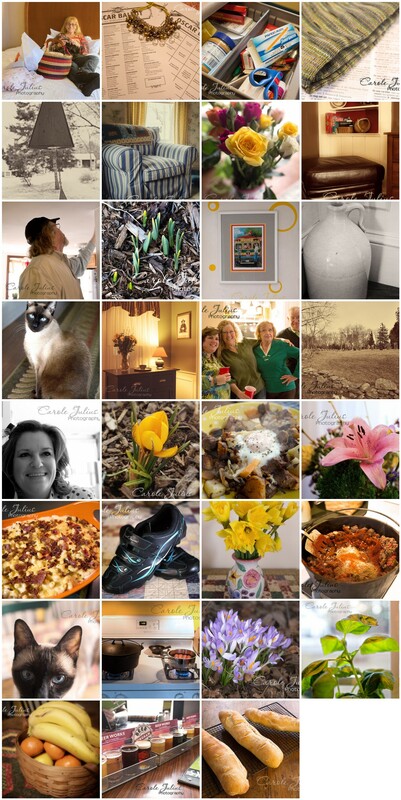 look forward to seeing spring in your April collage!